... artist within. That is exactly what the Gentlemen did this evening in the Gregorian Lounge with Hector Silva, a research associate in Industrial Design department. Through an invite extended by the Hall's in-Hall Academic and Arts Coordinator- iHAAC for short- Logan Arnold, Silva gave a quick tutorial of the basic elements of sketching. Afterwards, a challenge was given in which the elements were to be expressed in geometric shapes. All present gave it the old college go, and everyone was a winner because Chick-Fil-A was served after the dabble in the arts. 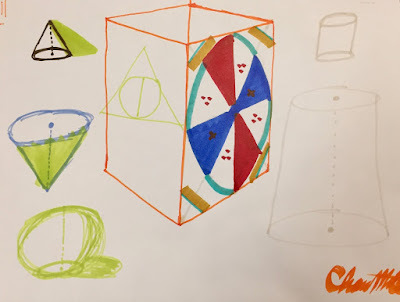 On his work, Chase Miller, Steds sophomore and budding artist, said, "The theme of my piece was the cyclical nature of student life encapsulated within the sharp 90 degree edges of a cube meant to represent the oppression of true learning. Furthermore, looking closer, the dots symbolize a smattering of chance seeing as life is a gamble. All of this done in the colors of the American flag to represent the unboxing of the Hall's most talented and humble artist, myself."